Welcome to my first in a series of posts in response to Tim Ford's #EntryLevel Challenge, which I learned about indirectly from reading a post by Steve Hood. SQL is what I'm good at, so I will be focusing on SQL and T-SQL in this series. To learn or practice with SQL requires two things: A database engine, and some example data. Microsoft SQL Server Express is a freely available and easy-to-install engine. Microsoft's Adventure Works example database provides a good set of tables with data designed to show off all that SQL is capable of doing. Put SQL Server Express together with Adventure Works, and you have a nice platform on which to learn and practice the SQL language. For those who are always seeking FREE technical learning opportunities, the calendar webpage of the Rocky Mountain Oracle Users Group (RMOUG) is a great resource to bookmark and check back on weekly. RMOUG volunteers compile notifications of webinars, meetings, and meetups from the internet and post them here for everyone to use. The information technology (IT) industry is always evolving and therefore always changing. The latest video on my YouTube Channel is a run through of using the Database as a Service (DBaaS) offering on Oracle Cloud. There have been a few minor changes in the interface since I last ran through capturing images, so the related article has been brought up to date. I used my dad for the cameo in this video. Hopefully this will help him get a little more recognition, as he’s pretty much a nobody on the Oracle scene at the moment. With your help this could change! This is just a short blog post about a simple DTrace script (dtrace_kghal_pga_code), that i recently wrote and published due to a PGA memory leak troubleshooting assignment. A client of mine noticed a major PGA memory increase after upgrading to Oracle 12c. The PL/SQL code did not change - just the database release. He already troubleshooted the issue with help of Tanel Poder's blog post "Oracle Memory Troubleshooting, Part 4: Drilling down into PGA memory usage with V$PROCESS_MEMORY_DETAIL" and identified the corresponding heap and allocation reason. your career, and feed some dreams too. Spring conference season is upon us. 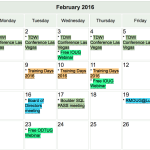 Planning for COLLABORATE16 in April has gotten me to thinking about conferences and missed opportunities. Do you remember the first time you didn't attend an industry conference? That's a strange question, isn't it? I don't remember my first time not attending an event, but I do remember one event in particular as a forever-missed opportunity. The event was the International Community for Auditory Display's (ICAD's) 1998 conference in Glasgow, Scotland.